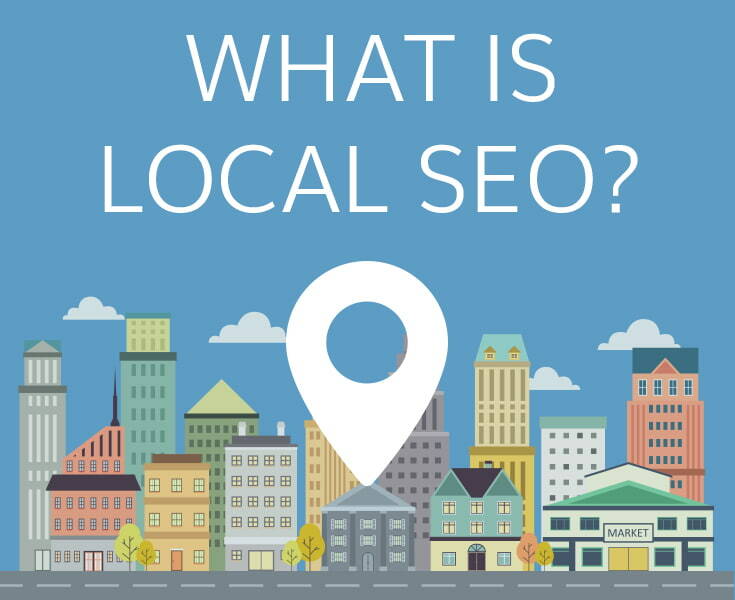 What is Local SEO? Local SEO is relying on your physical business location to help rank in search engines. This is really helpful for people searching for localized stores or services. There’s a good chance that your competitors aren’t using Local SEO as part of their marketing strategy. Around 56% of local stores haven’t claimed their Google My Business listing. The most powerful way to claim your business is with Google My Business. This is a great free tool from Google. It will help people find your business when searching in Google Maps or Google Search. Since Google holds around 75% of the search engine market, we will only focus on Google in this article. But it’s worth noting that it’s important to add your business to Bing Places and Apple Maps. As mentioned the best tool to focus on for Local SEO is Google My Business. Around 46% of all Google searches are local. So as you can see there’s a huge reason why your business should be listed with Google My Business. 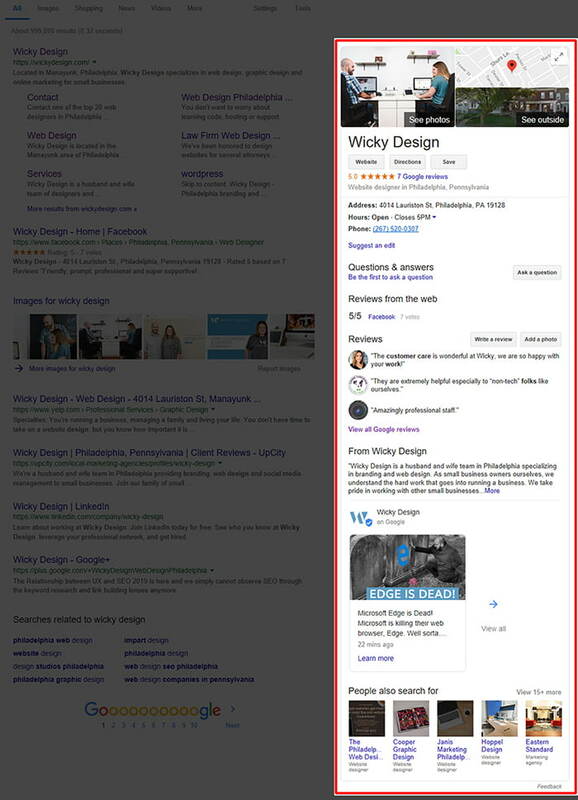 Below is an example of our local search results when you search for “Wicky Design”. The right side panel on the search results is all from our Google My Business account. Next will cover some of the most important things you need to do after you set up your Google My Business account. Under the “Info” tab is where you will enter all your business information. Of course, the most important thing to add is your physical location. Google requires you to enter a real address, they don’t accept places like virtual offices or P.O. boxes. Category – make sure to select 3 different categories. Don’t miss out on this important step. Website – Link directly to your website, don’t link to a Facebook page or any other social media accounts. You will need to make sure you keep all your business information current, you can always edit things in the future. Google will keep track of how many people visit your website, request directions, call and message you. So if you don’t have the correct information filled out, your insights information won’t be accurate. Upload photos of your physical location or if you’re running a service based business, upload photos of yourself or staff. This is a great opportunity to stand out and make a personal statement. Don’t use cheesy stock images of people that don’t work at your company. You will be amazed at how many businesses use stock images for their Google My Business accounts. If you have a physical brick-and-mortar business, we highly recommend looking into the 360 virtual tour feature (hire a trusted Street View pro). Google states that listings with photos and a virtual tour are twice as likely to generate interest. In 2018 they introduced videos to Google My Business! They allow videos up to 30 seconds. This can be a great way to introduce your business and show off your personality. Google released posts in 2017 and most businesses don’t take advantage of this feature. 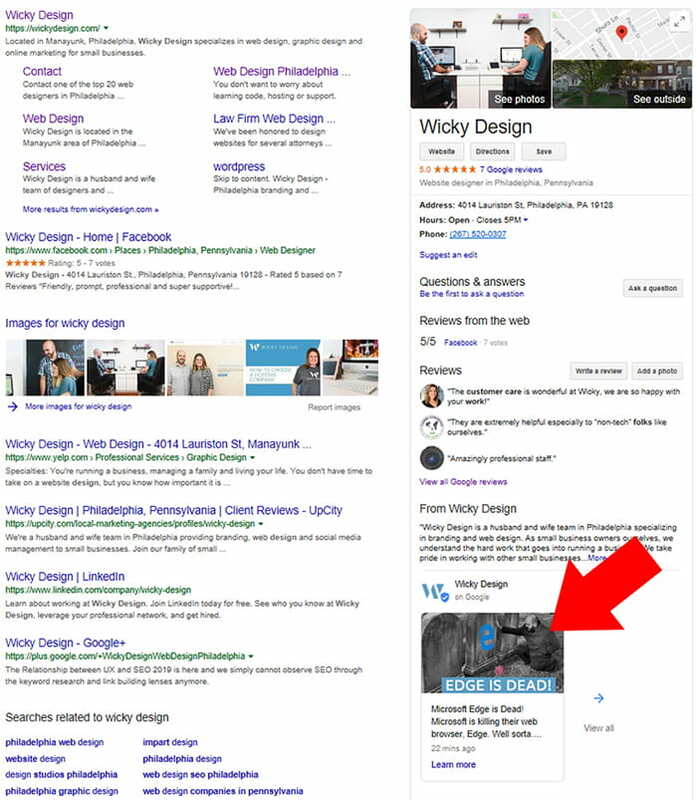 As you see in the image below (red arrow), you can place customized posts on your local business pages on desktop search results as well as the Google Maps app. The location of these posts has been moved down the panel on the desktop since Google released this feature in 2017. But on the Google Maps app, your posts will appear higher up on the “Overview” tab. This might change in the future, but it’s a great place to showcase a current blog article or a promotional item. Tip: Anytime we create a new blog article on our website, we add it to our Google My Business posts section. It takes maybe an extra 5 minutes to add a new post, so why not do it!? FYI: Your posts will only last 7 days. It’s important to add a new post every 7 days or so. We don’t recommend creating more than 2 posts in a week. Having reviews on your Google My Business page is really important. Review signals ranking factor can be as high as 15%. If you’re running a service based business, most clients won’t leave a review unless you ask them. If you’re running a brick-and-mortar business, more people will be leaving reviews on your profile. Make sure you try to respond to all reviews. If you receive a negative review, respond in a professional manner. People will be looking for how you respond to all reviews. The review responses will tell a lot about you and how you run your business. If you bad mouth or use foul language you will lose business! I personally won’t do business with a company that isn’t professional. If your business isn’t being listed in Google for local searches, you are losing out on business. Here at Wicky Design we have focused on Local & Technical SEO and have seen amazing results. We don’t spend any money on advertisements or shady SEO practices. Every year Moz releases their Local Search Ranking Factors Survey. Check out the link to see exactly how important local search results were 2018.